Molly, in her home, her garden and her lifestyle, clearly mirrors her love of growing things, of all beautiful plants, rhododendron especially. 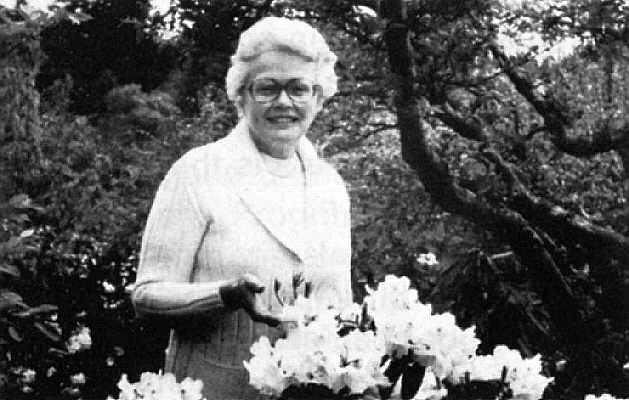 For many years she was garden writer for the Oregon Journal, covering all phases of gardening. To the Rhododendron Bulletin in 1973 she brought these ample qualifications. Without actually using a by-line her presence was felt in all those 21 issues of the Bulletin. At the present time, Molly is on the National Board of the American Rock Garden Society. Since early in 1977 she has been a staunch supporter, in many ways, of the formation of the Berry Botanic Garden, now a fact. There is an article on rock garden plants for shade in a recent issue of Pacific Horticulture. Perhaps there may be an article by Molly in a future issue of this Bulletin? The best of wishes to Molly in her return to full-time plain dirt gardening.